Our commonsense understanding of the words “yoga” and “meditation” suggest that they are two separate things: One of the body and one of the mind. But as we go deeper into the practice either one, we find a deeper unity at their core. 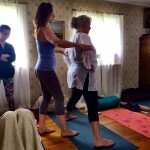 A weekend workshop with special sessions for yoga teachers. You will need to attend the whole weekend workshop “Asana as meditation – Meditaiton as asana” in order to join the extra sessions for teachers. This is to ensure that you have an embodied understanding of the techniques we will be working with in the last session on sunday. Saturday 9.00-9.40: Welcome and introductions (open to yoga teachers). What will be todays main teaching techniques? How to listen when you are a teacher/student attending a workshop. A dynamic yoga class exploring sensitive movement as meditation in action. Alternations between seated meditation periods and supine yoga posture flows releasing tension. A few words abut todays main teaching technique (svaramukta). Q&A from yesterdays workshop from a teaching perspective. A dynamic, sensitive yoga posture flow releasing the free rythm of the breath (svaramukta). The class makes a seamless transiton to a seated meditation practice towards the end. Sunday 14.00-17.00: Teaching skills (open to yoga teachers) Inspirational workshop on how to teach asana as meditation. Alternating between dialogue and little practical explorations we break down the progressive instructions used in the previous workshop. Birgitte will guide collective explorations of two simple techniques to play with in your own practice and share with your students. Open to trained and trainee yoga teachers from all branches of the yoga family tree.